Our Skills Development month or the month of the Economics of Education and Skill Formation continues this week by looking at any further or better skills we need as a CENFACS Community to continue to help to reduce poverty and enhance sustainable development. We are focusing on Disruptive Skills to do that. Disruptive Poverty Relief Skills are those can significantly alter the way the entire poverty relief industry operates. These are the abilities and talents that may enable someone to add to or move away from traditional established ways of dealing with poverty. In doing so, they will help to access new markets and value networks or chains as well as to develop new products and tools to deal with poverty and unsustainable development. For more on Disruptive Skills for Poverty Relief and Sustainable Development, contact CENFACS. Our A la une campaign continues as well with the last themed area of work, which is Forests and Lands. This week we will try again to push forward for the understanding of the forest lands issue, and action to deal with this issue. The outcome from this week’s sub-campaign is to help trigger change of mindset and action for the upkeep of forests (i.e. trees and wood plants) and lands. Further details about this themed area of work are given under the Main Developments section of this post. High on the next week’s agenda will be our 9th Development Day. This year’s focus is on the Circular Economy, on how it can be used to empower families, in particular but not exclusively women/mothers and children. In our thoughts, we will be using decoupling theories of the circular economy, theories that push forward for the decoupling economic development from consumption and exploitation of natural resources. For more on WCFDD, read under the Main Developments section of this post. ~ Charity e-Store: Festive SHOPPING and DONATIONS! Every occasion and or every season is an opportunity to do something against poverty and hardships. This coming festive season is one of them and is a great time to share precious moments with your love ones. It is also a time to spread a little extra happiness to those who do not have. You can give your unwanted and unneeded goods to CENFACS’ Charity e-Store, the shop builds to help relieve poverty. You can buy second hand goods and bargain priced new items and much more. You can do something different this Festive Season by SHOPPING or DONATIONS GOODS at CENFACS Charity e-Store. To undertake the upkeep of forests and lands in Africa and elsewhere, it makes sense to preserve the lives of species of flora and fauna, to continue to reduce poverty and to enhance sustainable development. 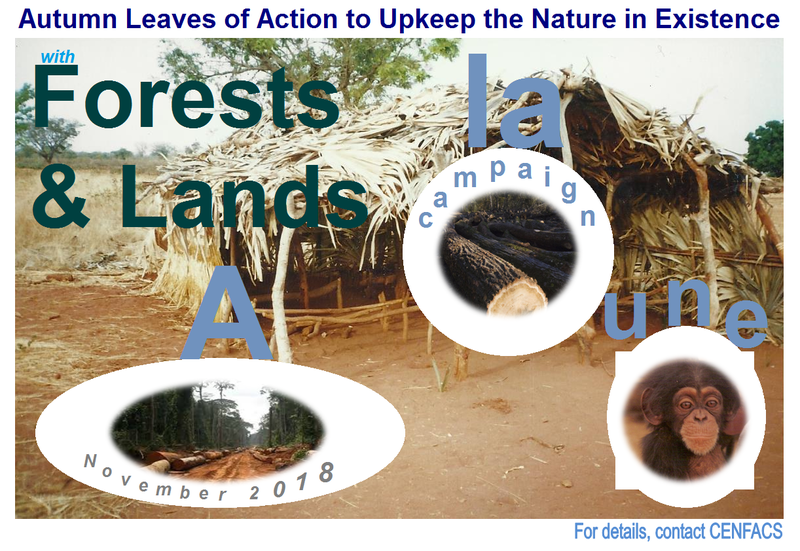 In the context of this campaign, it goes without saying with the following causal links which help to elucidate action for the upkeep of the nature: links between forests, lands and poverty reduction; links between forests, lands and species; links between forests, lands and sustainable development. Let’s see these causal links first, and then explain what we are campaigning for. ‘Of an estimated 250 million people in or around tropical forests and savannahs living below the extreme poverty line, 63 percent are in Africa’ (p.11). In terms of this campaign, let’s simply say the following. Poor people rely on forests as they share the same space. Forests provide the following benefits. Forests are a source of subsistence for food, fuel, medicine, shelter for forest dwellers, housing materials etc. They can provide savings and insurance for the poor and forest-based economies. From the above benefits, it is right to advocate that the way humans can deal with forests and forest lands can impact poverty and its reduction. There tends to be economic linkages between rural poverty and land degradation. There seems to be association between poverty alleviation, natural tropical and lands in Africa especially in rural areas. There are scientific researches which show that forest destruction, habitat fragmentation by human encroachment in forest areas can increase exposure to zoonotic infections via interaction with wildlife reservoir species and enhance exposure to other diseases. Likewise, it is a matter of fact that dry land forests, which are critical to the survival of humans and animals are under considerable pressure of degradation, are a problem for some species like vulnerable African elephant species and black rhinos. These species depend on eco-systems for management and shelter. Again, the above suggests that there could be links between the state of forests, lands and the well-being of species of flora and fauna. Campaigning for the reverse of the degradation of dry land forests is a deserving cause for the upkeep of the species of flora and fauna. Simply speaking sustainable development covers three basic areas: environmental, economic and societal sustainability. If we pick up environmental sustainability, particularly climate change, it is pointless to say that there is a possible link between deforestation and climate change. Deforestation and forest degradation can cause carbon emissions. Reducing the over-exploitation and demand of timber can help for forest resources in Africa and elsewhere. 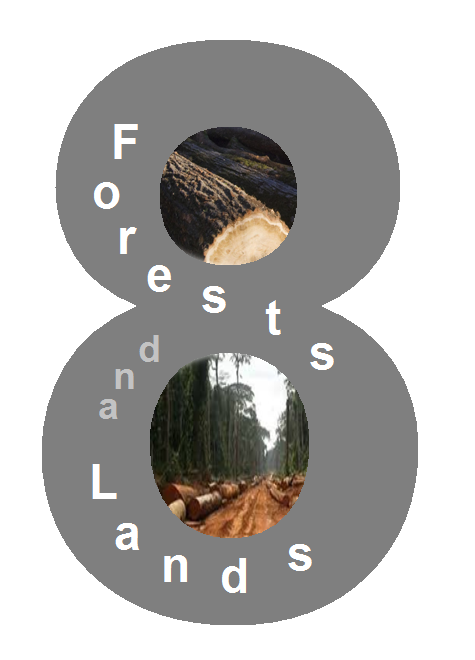 Forests and Lands sub-campaign is an action for sustainable forest and land development. It is a crusade to save or rescue species of plants and animals found in the rainforests, especially but not exclusively in the tropical forests of Africa. It is a drive that addresses the following issues: the destruction of trees of the rainforests by logging, the clearance of vast areas of forests for various reasons, the cutting down of trees and the burning of the scrub etc. It is a fight against deforestation-related externalities and illegal conversion of forests for export-driven industrial agriculture. It is finally a stand for the improvement of climate finance for forest conservation, anti-deforestation dividends, the restoration of degraded lands, the protection of vulnerable forests, and the care about forest and land development targets. To support Forests and Lands sub-campaign and A la une campaign generally, contact CENFACS. The coming WCFDD will about thinking ways of working together to come out of the linear model that consists of make, use and dispose goods and resources; to embrace the circular economy. Circular economy or circular economic development has been around for many centuries, but it has never been the economic model that one can think of in the first place when it comes to produce and consume resources. Every day we hear about re-use, repair and recycle. But, in the way people generally act and behave, only few of them care about these three expressions (re-use, repair and recycle). It is often the paradigm of linear economic model that prevails in humans’ mindset and the way they behave. This Development Day (DD) is for us to explore paths of making the circular economy as our everyday’s economy from family to work and passing through different aspects of our living outside the family and work circles. The DD will seek to find strategies to adapt the principles of the circular economy to our daily family life, and to rethink or rebuild family relationships in integrating the circular economy. The DD will have two areas of thoughts (i.e. adaptation and transition to the circular economy). But before getting further about these two areas of our development day of thoughts, let’s define the circular economy. There are many circular economy schools of thought and definitions of circular economy. For the purpose of our development day, we are going to borrow the definition of circular economy from Ellen McArthur Foundation (2) which defines it in these following terms. This definition can be extended to family life and framework where those making this family are involved. Because our development day is about women/mothers and children, let’s say where women or mothers and children are concerned; their involvement is in their handling or customizing the above three principles. In other words, in terms of family settings, we/they will be trying to think how they can design out waste and pollution, keep products and materials in use, and help regenerate natural systems in their ways of dealing with natural resources. 1st Area of Thought: Adaptation of the circular economy principles to family models of working and the lives of women/mothers and children. In this first area of thought, we will be rethinking the key functions of a family and family setting in which its members (here women/mothers and children) are part of. We will then try find out how to adapt to the circular economy or the regenerative economic development or way around how this economy can be adapted to the family life.. The second area of thought will be about the transition process from a linear economic model of managing natural resources to a circular economic model of operating for women/mothers and children. It will be about developing a strategy to work with resilient families (including women/mothers and children) for transitioning to a circular economy, for making both mental and behavioural shifts in embracing the circular economy. Both adaptation and transition processes will prepare the mindsets of those who are willing to embrace the circular economy to decouple poverty relief and economic development from consumption and exploitation of natural resources. For example, to reduce poverty and enhance sustainable development, those in need do not always have to resort to cut down trees or destroy natural resources. Another example, humans can re-use household items by extracting the maximum value from them before thinking of replacing them with new ones. It is in this way they can help build economic, natural, and social capital they need. Since its inception in 2010, the WCFDD provides an opportunity and scope to communicate CENFACS’ anti-poverty work/message and the need to develop new ideas and proposals, and improve practices to enable us to enhance the quality of life of multi-dimensionally-deprived women/mothers and children. 3W (What Women Want) is a CENFACS support network scheme to enhance the lives of multi-dimensionally deprived women/mothers and families.